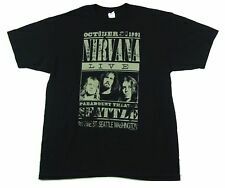 Vintage Vintage Nirvana Live October 31 1991 T-Shirt__See Pictures For Size. NIRVANA BLACK T-SHIRT, CLASSIC SMILEY FACE, BABY SZ 6M, SUPER COOL, NEVER WORN! Vintage PRINCE AND THE NEW POWER GENERATION Shirt 1991 never worn!!! NIRVANA shirt KURT COBAIN vtg 2000 The End Of Music Rare Authentic Vintage !!! Vintage Pearl Jam Limited shirt only 600 made nr. 577 Ultra Rare Collectors !!! Hard Rock Cafe (New York) - Vintage T-Shirt (1991) Mint Condition! Un-worn!